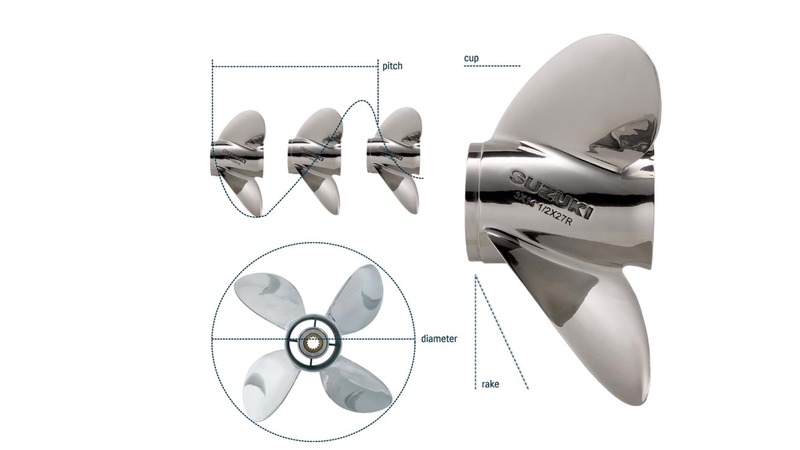 Propeller selection is very important in the performance of your boat. Acceleration, speed, fuel efficiency, stability and engine RPM all are affected by the propeller selected. Operating requirements and conditions will also affect which design, style and pitch of propeller you may choose to meet your individual needs. The boat and engine combination may have already been tested by your dealer or the boat manufacturer for the appropriate propeller size. Your Suzuki Dealer can assist you with the process to determine the correct propeller for your application. Suzuki stainless steel propellers offer higher performance and greater durability than aluminium propellers. The Suzuki stainless steel propellers offer higher performance and greater durability than aluminium propellers. The aggressive design of these propellers enhances the overall performance of your boat and the durability of the stainless steel construction will give you even more long-term dependability. Your Suzuki stainless steel propeller is also fitted with a rubber cushion hub to help absorb vibration and shock should you strike a foreign object. When referring to propeller size, such as 3 x 13 x 18, the first number details the diameter of the propeller and the second number is the pitch of the propeller. The pitch is the most significant number in the description. The diameter is usually predetermined by the propeller engineers and is based on the size and series of the engine. Diameter is considered to be the distance across an imaginary circle that is made when a propeller is rotated. Diameter is determined during the engineering process of designing a propeller and is usually based on requirements to meet the needs of engine size, gear case design, horsepower and speed. Pitch is used to describe the theoretical distance that a propeller “cork screws” through the water in inches of forward travel. In theory, an 18” pitch propeller would move ahead 18” with each complete revolution of a propeller. There is always some percentage of inefficiency as water conditions, boat weight and propeller style are introduced into the performance equation. Lower pitches accelerate faster, but have a lower top end speed. Higher pitches have a slower acceleration, but may attain higher top speeds. An inch of pitch generally is equal to 150 – 200 engine RPM at full throttle. If pitch is increased by an inch, RPM will decrease by 150 – 200 RPM at full throttle. If pitch is decreased by an inch, RPM will increase by 150 – 200 RPM at full throttle. Always operate your boat/engine combination within the recommended RPM range guidelines as stated in your operator’s manual. Operating outside the recommended range can cause severe damage to your engine and may void the engine warranty. Cup is used to reduce the slip and ventilation of the propeller. This will allow you to operate your engine at a higher transom mounting and allow you to use more trim for bow lift. The cup refers to the area along the trailing edge of the propeller blade that has an increased pitch in the last 1/2” of the blade surface and extends to the blade tip. Rake is described as the angle, in degrees, that the propeller blades are mounted to the “barrel” of the propeller. The blades of a zero degree rake propeller are mounted perpendicular to the “barrel” of the propeller. The blades of a higher rake propeller angle more to the rear of the propeller. A propeller with a high rake design will hold the water on the blades longer during operation and will ventilate less at higher engine heights. High rake propellers will produce higher thrust that will help lift the bow of the boat more effectively. Buy your genuine propeller at our online shop now.